– Google plans to give $1 billion in grants and 1 million employee volunteer hours in the next five years. – IBM’s travel program sends their best employees to developing nations to use their talents on pro-bono assignments. – Patagonia’s Action Works initiative supports grassroots environmental activism by pairing individual volunteers with non-profits in their communities. – Microsoft gave non-profits $1.2 billion in services and software last year. Because of their scale, these corporate programs have a deep and obvious impact on the planet. 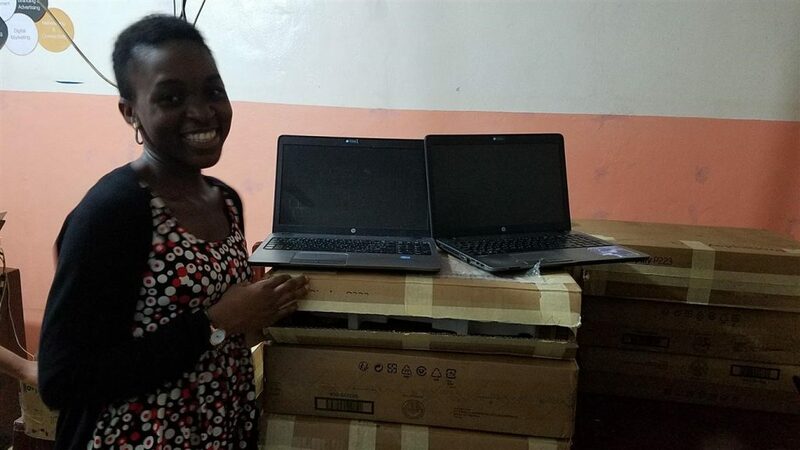 But organizations can have a staggering effect on a smaller scale, too—just one person and 20 computers were enough to transform the future of a town in Africa. A chance meeting through a mutual friend introduced Execs In The Know co-founders Chad and Susan McDaniel to Yembe Nfor, a young man from Cameroon with a vision for bringing technology to his country. His story inspired them so much, they asked him to share his message with their children. He spent hours with the family, detailing his vision for a space where people in his city could access the internet. The kids were moved to help in any way they could, as were their parents. Chad and Susan turned to the EITK community to see if they could obtain the resources he needed, gathering support by sharing Yembe’s tireless individual endeavors. Who is the Aspirational Consumer? The voice of the customer is transforming, and the resounding call from the “Aspirational Consumer” is here to stay. No longer can marketer’s think of the customer segment that wants to “do the right thing” tree-huggers because “doing the right thing” is now becoming the “cool thing to do.” The rise of this customer segment is redefining consumerism by blending style, status, and sustainability. The identity of the Aspirational Consumer is defined by their infatuation with shopping, their commitment for responsible consumption, and their loyalty to brands that work in the best interest of society. The reason this brand-hugging consumer segment is gaining the attention of marketers is because Aspirationals are some of the most materialistic consumers, yet at the same time are the most driven to purchase products that connect to their personal aspirations of creating a brighter future for society and future generations. There is a profound opportunity for consumer brands to appeal to Aspirational Consumers, because market studies have estimated this group to make up over 1/3 of today’s market and have highlighted the fact that Aspirationals are some of the most brand loyal customers possible. Similar to how the car was once an external expression of your inner-self; aspirational consumers are expressing their interval values to the world through the brands they loyally love and frequently purchase. The companies that understand this opportunity the most are focused on creating a meaningful and authentic purpose for their companies that expands the customer experience to involve the customer in the collective achievement of the brand’s higher-purpose. Brands that have an aim to make a brighter future are winning the hearts of customers, and it’s hard to find a brand aiming to win over the hearts of socially minded customer’s more than Unilever. Embracing Unilever’s goals of social responsibility, the multinational company has launched Unilever’s Project Sunlight with the goal of creating a brighter future. Project Sunlight embodies Unilever’s purpose of building a #brightfuture for the world by creating an inspirationally engaging online and offline community where Unilever’s brand-hugging consumers can connect and be a part of the brand’s higher purpose. The companies that are getting customers to love their brands the most are utilizing people’s natural inclination to reach towards being a part of something bigger than themselves, thus enabling the customer to be more engaged, inspired, connected, and proud while collectively achieving the brand’s higher-purpose during their customer experience. This new insight is expanding marketer’s view of what the customer experience is really all about, much more than customer service, pleasant store atmospheres, quality products, and user-friendly software, it is about meaningfully connecting with the values and ideals of the consumer. The brand’s higher-purpose is now an integral part of the process for designing the customer experience, and for up to 1/3 of the market, it is one of the only ways to get consumers to truly love your brand in today’s ever-increasing competitive environment. When getting consumers to truly embrace your brand, the purpose and brand promise must be so authentic that it is embedded in the brand’s DNA. To do this, the brand promise and purpose must be baked into every level or people will smell it from a mile away. For example, if you think of the customer’s brand loyalty like a relationship, how can a customer truly love a brand that breaks the promise or lies to their face? If your brand is dependent on repeat customers, maintaining a strong brand promise that builds life-long customer relationships is critical to long-term business success, otherwise the customer may just purchase your product for a while as they keep an eye out for something better. This means that if you contribute to the design of the customer experience, your goal must be to transition brand-purchasers into brand-huggers because if you can do that, you have just found yourself a lifelong customer. From the surface, sustainability and social responsibility are synonymous terms, two sides of the same coin. It is only when one looks deeper into their meanings that the subtle differences raise to the surface. The idea of sustainability comes from the fundamental concept of sustainable development: meeting the needs of today without compromising the ability of future generations to meet their own needs. The concept of sustainability looks through the lense of the triple bottom line: people, planet, and profits. The notion of the triple bottom line aims at accounting for all the impacts of an organization into a common set of bottom-line metrics that determine the value of investments based the long-term sustainment of economic, social, and environmental capital. Aiming to sustain the long-term economic, social, and environmental capital over generations is a worthy and important objective for any organization to aspire to, yet many organizations are struggling to put this into action because for many people the concept is hard to grasp and the metrics these market-based organizations are using to make decisions are conflicting with each other.